Ankylosing spondylitis, AS, is a form of spinal arthritis. AS can cause the sacroiliac joint between the spine and hips to fuse. The ribs can also fuse in AS causing breathing difficulty. Although neurological symptoms are rare, notes the Spondylitis Association of America, nerve pain and irritation can result from nerve impingement in the spine and joints. Cauda equina syndrome, CES, is a neurological disorder caused by the pinching of the spinal nerves in the lower or lumbar spine. The space between the vertebrae allow the spinal nerves the room to send messages throughout the organs, muscles and tissue of the body. These nerves come together in a canal at the end of the spine. This canal holds bundles of nerve roots that look like a horsetail. This nerve bundle sends and receives messages from the lower portion of the body to the brain. Cauda equina syndrome occurs when these nerves become trapped between the fused vertebrae. This entrapment causes numbness, pain and tingling in the legs and disrupts the functions of pelvic organs such as kidneys, urethra, prostate, large intestines and reproductive organs, according to the Spondylitis Association of America. Radiculopathy is a nerve root impairment that occurs when groups of nerves become pinched and inflamed at their core. Nerve roots are larger bundles of nerves that branch into smaller nerves covering the body. These impinged nerves do not receive sufficient blood flow and have difficulty conducting messages necessary for organ, and muscle functioning. Symptoms of radiculopathy include muscle control problems, tingling, numbness, weakness and pain in the arms and legs. Lumbar or low back radiculopathy is reported in cauda equina syndrome. Pain resulting from this nerve root impingement may radiate to other parts of the body. Cervical spondylotic myelopathy, CSM, in ankylosing spondylitis causes spinal inflammation in the neck, chest and arms. This inflammation causes pain in the vertebrae closest to the skull and forces the nerves against the vertebrae causing pain. Symptoms of cervical myelopathy include stiffness in the neck and deep pain on both sides of the upper spine. Shoulder pin and stumbling while walking are also symptoms of CSM because this pain radiates similar to the radiculopathy. The American Academy of Family Physicians also notes additional symptoms including crunching sounds with neck movements, sharp pain in the arm, elbow, wrist and fingers and numbness and tingling in the hands. Although there is no cure for ankylosing spondylitis, selective nerve blocks may ease the pain and discomfort associated with the fusing of vertebrae in the chest and lumbar spine. Nerve blocks use a fluoroscope, x-ray imaging tool that allows physicians to locate specific nerves and groups of nerves for medication injection. Steroids, opiates and anesthetics are used to reduce pain and inflammation in nerves trapped between fused joint facets, notes the Yale Medical Group. A study completed by Rheumatology International, January 2009, entitled “Neurological complications of Ankylosing Spondylitis: neurophysiological assessment” was authored by Eman M. Khedr, Sonia M. Rashad, Sherifa A. Hamed, Fatma El-Zharaa. 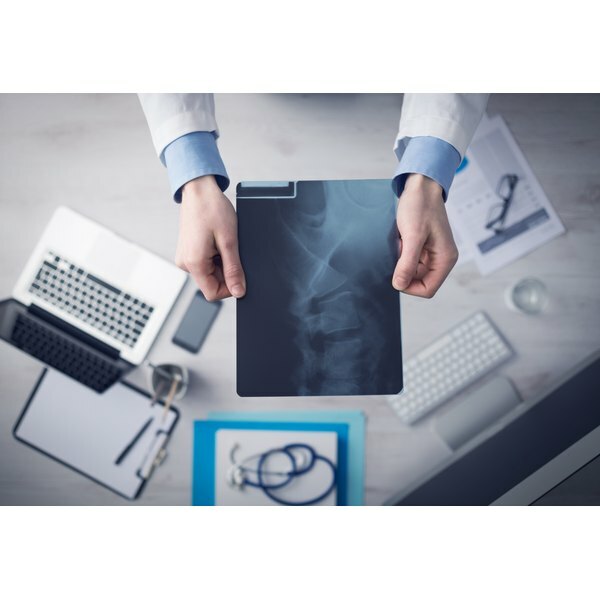 The study reported that of the 24 patients studied, 25 percent had neurological impairment such as cervical myelopathy that causes numbness and tingling in the arms and radiculopathy. The authors acknowledge that this was a small study and that additional study is necessary to assess the neurological symptoms of AS.